Carr Properties, together with Mayor Muriel Bowser, Councilmember Jack Evans, and project team members SHoP Architects and Clark Construction, broke ground today on Midtown Center, an 862,000 square foot, 14-story, LEED Gold certified, trophy office building located at the corner of 15th & L Streets, NW. 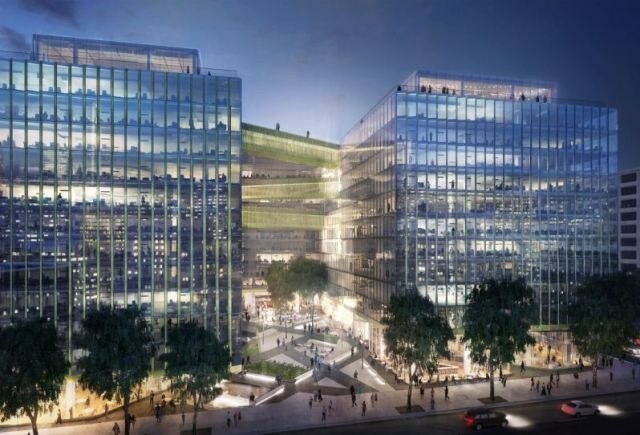 The completed project will be anchored by Fannie Mae’s new National Headquarters. “We are excited about the design quality and scale of Midtown Center and believe that all of the ingredients are there for the project to transform the area surrounding 15th and L Streets into a vibrant 24/7 location. Midtown Center will be a new hub of activity in the center of the City that will offer a great work environment and a tremendous street level dining experience,” said Oliver Carr, III, CEO of Carr Properties. Designed by New York-based SHoP Architects, Midtown Center will feature two full-height curtain wall office towers separated by an extraordinary European-style public plaza, inspired by the historic L’Enfant city plan, which will serve as a gathering place for shoppers, tenants and pedestrians alike. The amenities are consistent with the Building’s first class LEED Gold design and include 3 levels of below-grade parking, an 8,300 SF fitness center, a 1,300 SF bike room, a state-of-the-art 1,000 SF rooftop conference center with stunning views of downtown Washington D.C., and 50,000 SF of destination-oriented retail. Midtown Center will have a transformative impact upon the neighborhood and city. This 90,000 SF site served as the headquarters location for The Washington Post for over 50 years. Just four blocks north of the White House and other signature landmarks, Midtown Center borders two of the city’s primary thoroughfares, offering tenants extraordinary ease of access to the building and surrounding central commuting arteries, as well as immediate access to bike lanes and bus routes and only two blocks for Metro’s Blue, Orange and Red lines. Surrounded by over 3,500 nearby hotel rooms and bordered by the incredibly successful 14th Street Corridor, tenants will find themselves in a dynamic work environment full of vibrant activity at the heart of the city. Construction is underway at Midtown Center and completion is slated for June 2018.